The shoulder is a "ball and socket" joint, with the "ball" being the humerus and the "socket" being the glenoid - an extension of your shoulder blade (scapula). The labrum is a circular structure that sits on the rim that sits on the outer edge of the glenoid, the "socket" of the shoulder. The long head of your biceps tendon attaches at the top of the labrum. The labrum helps to deepen the shoulder socket and provide stability to the shoulder through range of motion. "SLAP" stands for "Superior labrum anterior abd posterior" and refers to a specific area at the top of the labrum. where the bicep attaches to the labrum. There are also different types of SLAP tears as well. What causes injuries to the labrum? 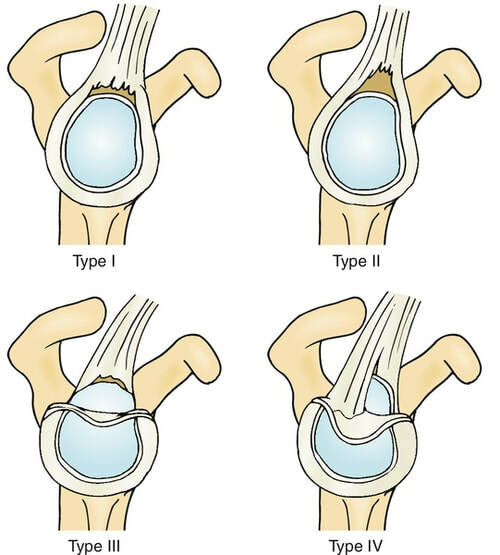 The labrum can be damaged through a traumatic injury, repetitive use over time and wear & tear. Based on a thorough history and physical examination, in addition to imaging a labral tear can be diagnosed. Your health care provider will ask you questions about your shoulder pain, then take you through a series of physical exam special tests to rule in or rule out different shoulder conditions. Shoulder Ultrasound: To rule out soft tissue abnormalities, although this test is limited by any structures hiding behind bone. The labrum may be partially visualized by the ultrasound but is not as sensitive to picking up labral abnormalities as an MRI. Shoulder MRI: An MRI provides much more detail about soft tissue with some information about bony structures than an ultrasound. Shoulder MRI with contrast (MRI arthrography): An MRI with contrast involves injection of a dye into the shoulder. In a "normal" shoulder with no tears or abnormalities, the dye will occupy a certain space in the shoulder joint. 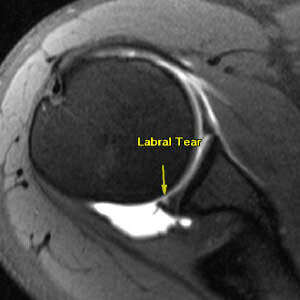 However, if there is an abnormality like a labral tear, the dye will leak into structures or spaces that is should not. The Bright white in this MRI image is the contrast dye. Here we have a transverse (horizontal) view of the shoulder. What is treatment for labral tears? Modifying your activities - This involves avoiding activities or arm positions that make the pain worse. Physiotherapy - Physiotherapy for labral tears involves improving range of motion and strength, while using modalities to decrease pain, swelling and inflammation. Pain medication - Pain medications like oral anti-inflammatories (over the counter and/or prescription) can be a temporizing measure to help alleviate pain in the shoulder from a labral tear. Topical anti-inflammatories (e.g. Voltaren Gel Strength, massaged to affected areas three times per day) can also be helpful. Be sure to speak with your health care provider (Physician, Physician Assistant or Nurse Practitioner) about different medications that can help. 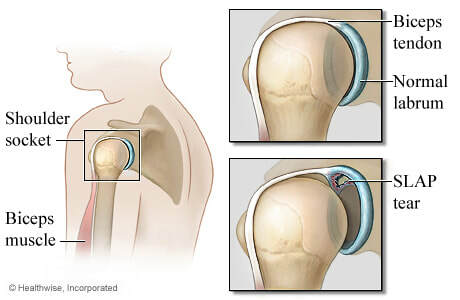 Here are two different types of labral repairs. Sketch of an arthroscopic labral repair, where torn labrum is sutured back down to the rim of the glenoid. What is involved for Physiotherapy after a Arthroscopic Labral Repair Surgery for the Shoulder? Every time you have a post-operative follow-up with your Orthopaedic Surgeon, you should receive a prescription for physiotherapy at each visit. This prescription usually outlines the instructions for the physiotherapists - this may include what range of motion exercises they may start, when to start strengthening, and what exercises to avoid. Physiotherapy for a labral repair follows a specific protocol (for example, the protocol for physiotherapy after a rotator cuff repair differs from a labral repair). After a shoulder arthroscopic surgery, patients spend a few weeks in a shoulder sling to help protect the labral repair. ​After which there is a gradual progression of range of motion exercises. Physiotherapy can also provide modalities (e.g. TENS, cryotherapy) to reduce pain and inflammation. Physiotherapists will also work on your elbow and wrist to ensure you maintain good range of motion and function while in sling, this includes range of motion exercises in addition to gripping exercises. While the shoulder is in sling, your physiotherapist will work you through passive range of motion exercises. In the next phase of post-operative physiotherapy, your physiotherapists will start you in careful active assisted range of motion. You will also be assigned exercises to do at home. You will eventually progress to strengthening of the shoulder. This is carefully monitored with the goal of improving your shoulder function. Our Physiotherapists See Patients with Labral Tears!